Fisheries Victoria – Fisheries Research Branch (FRB) uses sophisticated mapping systems and technologies to map Victoria’s diverse and complex marine habitats. Marine habitat mapping provides important information for managing our marine resources and its applications include management of fishery habitats, aquaculture development, Marine National Park planning and environmental assessment of coastal development proposals. Shallow habitat mapping at East Gippsland (Marlo to NSW border). Shallow habitat mapping at the Corangamite coast (Cape Otway to Barwon Heads). 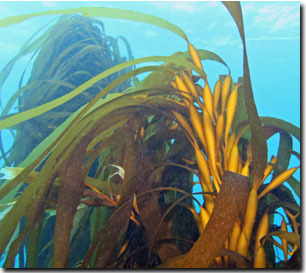 Unlike mapping habitats on the land such as forests or grasslands, marine habitats are hidden beneath the sea. This combined with the impact of waves, currents and tides presents considerable challenges for mapping marine habitats. 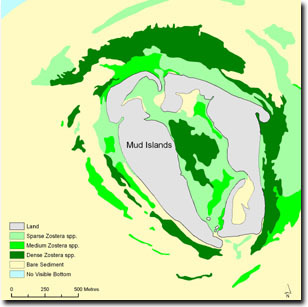 While some terrestrial mapping approaches have been adapted to marine habitat mapping, we need specialised equipment and mapping techniques to reveal what lies under the water. Aerial optical imagery captured from aircraft or satellites is one of the main data sources for mapping shallow marine habitats. Aerial imagery for marine habitat mapping needs to be captured under conditions that allow a clear view through the water to the seabed and this requires periods of clear water, calm seas, light winds, low sun angle to avoid reflection off the water surface and preferably a low-tide. 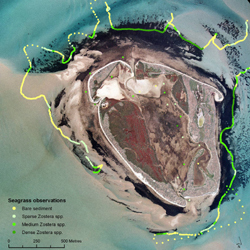 This poses one of the greatest challenges for mapping marine habitats from aerial imagery in Victoria as even in relatively sheltered embayments, such as Port Phillip Bay, it may take months of waiting for the right combination of conditions to occur to capture suitable images. The situation is even more difficult on the exposed Bass Strait coast where strong swells mean that the right calm sea conditions may only occur a couple of times a year in some places. Under optimum conditions the maximum depth of habitats visible in aerial imagery in Victoria can be up to 15 m in Bass Strait but as low as 1 m in turbid estuaries. Typically though, the depth limit for marine habitat mapping from aerial imagery in Victoria is about 5-10 m.
Where it is too deep to use aerial imagery, we can use the reflection of sound off the seabed rather than light to map marine habitats. Acoustic mapping systems allow us to measure depth and also record information about the physical structure of the seabed at all depths. 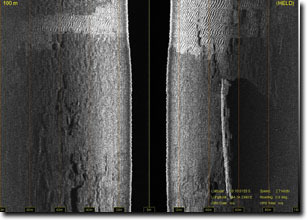 Echogram showing return signals from a sandy seabed to the left and a rubble reef to the right of the image. 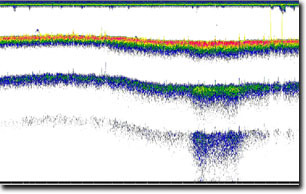 Single-beam echosounders record information about the physical characteristics of the seabed and the depth immediately beneath a survey vessel. 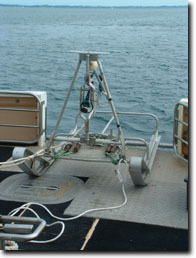 The echosounder operated by FRB outputs data to a mapping software that digitises the return signals from the echosounder and also logs the depth and position information from a Global Positioning System (GPS). The echosounder emits a sound pulse or ping and a measure of the seabed hardness and roughness can be estimated from the strength of the return signals or echoes reflected by the seabed. Data recorded from the echosounder are presented in the form of an echogram, which is a pictorial representation of the water column. FRB also conducts marine habitat surveys with a sidescan sonar. Sidescan sonars are seabed imaging systems that emit fan shaped sound pulses from transducers mounted on both sides of a torpedo shaped towfish. The towfish is towed underwater behind a survey vessel at a fixed height above the seabed. 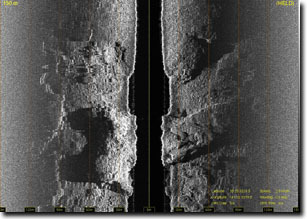 The sound pulses emitted from the sidescan sonar cover a wide swath of the seabed either side of the towfish. The return signal is transmitted to a data recording unit and screen display via an electronic cable connecting the towfish to the survey vessel. 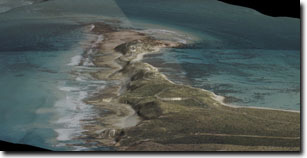 The sidescan software translates the return signal into an almost photo-realistic image of the seabed that highlights its texture and the structure of features such as rocky reef and sand ripples. 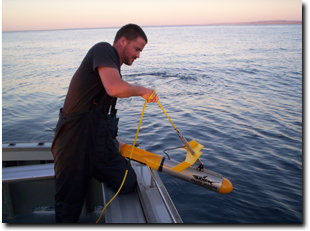 Sidescan sonars are also widely used in locating shipwrecks and other sunken objects. Aerial imagery and acoustic mapping systems give us information to map the distribution of different habitats, but we need to verify or ground-truth our habitat classification from the imagery with direct observations in the field. SCUBA divers are used where we need to make detailed observations on the ecological characteristics of marine habitats, including the diversity and population of marine plants and animals. Divers record habitat measurements directly in the field and also take photographs and video with underwater cameras at survey sites. Underwater video systems have the advantage of being able to operate in locations and depths that would be hazardous for SCUBA divers and can stay underwater for as long as required without needing to come up for air. 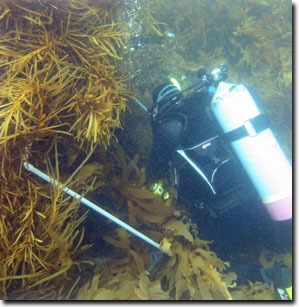 FRB has developed a number of underwater video systems for operating in different marine habitats from shallow seagrass beds to deep rocky reefs. The video systems are either lowered below a survey vessel on to spot sample sites or towed along transects traversing different habitats. 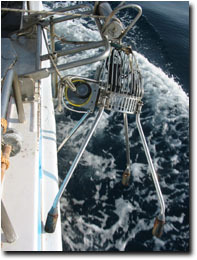 The video cameras transmit a live-feed back to a screen on the vessel where scientists can observe the seabed and the footage is recorded to a DVD to allow later analysis. The video recording system also integrates positional information from a GPS and depths from an echosounder. Underwater video systems can also be used to observe the presence and behaviour of fish and other marine animals in different habitats. One approach to this is to use “baited-video” where a bait bag is attached to the camera frame to attract fish and other animals to come within the camera’s field of view. PIRVic MAFS underwater video system for surveying reef habitat. FRB operates a Geographic Information System (GIS) to manage the different spatial information generated during its marine habitat mapping programs and to translate this data into marine habitat maps. Specialist aerial and acoustic imagery processing software are used to geo-reference and analyse the imagery before it is integrated with the GIS. 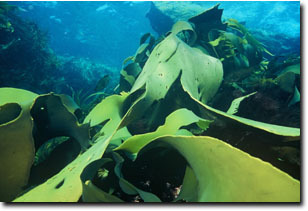 Underwater video and photography can also be linked to the GIS through its positional information recorded with a GPS.